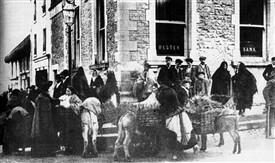 Formally called the Ulster Banking Company the name was changed to Ulster Bank in 1883. This is a corner sited building on both Glebe Street and Abbey Street and recorded as a four bay, three storey over concealed basement, cut limestone, banking house c. 1895. It is no 83 on the Mayo County Council’s preservation register. Its main entrance has a square headed moulded stone surround and has stone cills encasing casement windows. 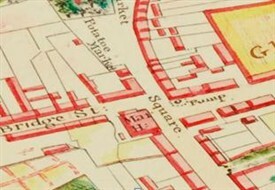 The dominant corner site was probably an open market area with a central well, part of which was moved to accommodate the new building. I have been informed that part of the well was still accessible through a small door adjoining the Bank on Abbey Street side till the early 1900’s and may still exist to this day (needs clarification). A reference in Sept 1875 in the Ballinrobe Chronicle suggests that the Ulster Bank is being built. Many of the banks of the Victorian and Edwardian age were grand, purpose-designed banking houses. Their magnificence reflected the growing size and importance of the business conducted there. The preference was for prominent corner sites and the building material used in Ballinrobe was excellent quality. The principal branches were designed to impress usually in a classical style. 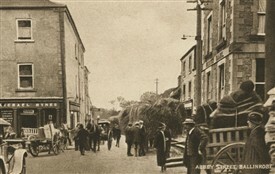 In smaller towns and villages, it was common to adapt space in existing houses, shops or hotels for bank use. On the corner outside, a poultry market was held. One can see evidence of an early gas lighting pole on the Abbey Street side of the bank. 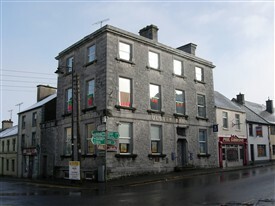 Being the third bank to open in Ballinrobe is evidence of the commercial success of the community and the town. 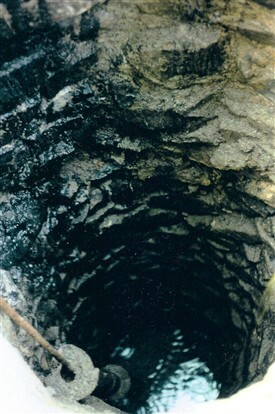 During excavations for a new sewage system in the town in c 1992 a well, located outside the front of the Bank, was opened up having been covered by two flat slabs. It measured 1 meter in diameter and was 18 meters deep. It was constructed of dry stone undressed masonry apart for the top 5 courses which contained mortared joints. This may be considered of a medieval date and it later appeared as a pump on Knox’s 1832 map. Details were recorded and it was covered up to preserve it for future investigations. One can see the road level was lower in the past as there were to hight steps to the footpath close by. Mr. Charles James was the first agent (Manager) of the Ulster Bank having served in Ballinrobe from 1874. The next agent was Mr. Alexander Beaumont. Walsh, Gerry. Archaeological Excavations on the Ballinrobe Sewerage and Sewage Disposal Scheme 1994. Mayo County Council, 1995.